The Kansas Army National Guard (KSARNG) is a military organization of more than 5,500 authorized soldiers within Kansas. 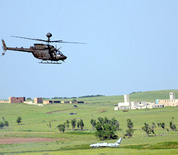 The Adjutant General's Department has a number of training facilities near Salina that serve both military and civilian personnel, including law enforcement, fire, search and rescue, emergency medical and other first response and public safety agencies. These facilities allow military and civilian personnel to remain in Kansas rather than expend unnecessary time and money in traveling out of state to receive the training they need.